At one level, Rigid Audio’s Synferno is a Kontakt-based construction kit loop library, offering 1200 24-bit loops organised into 300 preset ‘kits’ with a bass, synth, ambient and groove loop within each kit. The loops themselves would fall broadly into the EDM category and, while the world is not short of loop libraries of this style, this collection is certainly competitive, with lots of great synth sounds/loops and some very cool electronica-inspired drum beats. However, Synferno is more than just another collection of EDM loops, and what is really rather impressive is the Kontakt front-end through which you access this loop content. Yes, this includes the usual options for adjusting levels, pan and EQ for each loop individually, but there are also various effects that can be applied at an individual level to each loop. These include autopan, distortion, a filter, bit-reduction, saturation, compression, modulation, delay and reverb. Nothing too revolutionary, but all very effective and the reverb is a rather nice-sounding convolution-based design. Where things get very interesting is within the Sequencer section. This provides a 32-step sequencer that allows you to slice your loop and then, via a very intuitive graphical user interface, control which slice plays back for each step within the sequence. This is obviously great for chopping up the drum loops but, as with the effects, what you get here is separate loop slicing/sequencing tools for each of the four loops within your preset; if you want to turn the ambient pad loop into a rhythmic pattern, for example, then that’s very easy to do. It’s not possible to cover the detailed options in a review of this length, but the feature set provides some excellent details and creative possibilities. That said, one further trick within the sequencer is worth highlighting: there is also a lane for specifying which source loop is used on each step of the sequence. For example, if we take the synth loop channel as an example, while you might start with a single default loop and slice and dice it within the sequencer, you can also use the step sequencer to load a different loop for any (or all) of the steps. This also gets sliced, and the end result is an almost endless array of mixing and matching and loop slicing. Add in the fact that the front-end includes some very nice randomisation options and manual slice triggering, amongst other things, and Synferno could become a great tool for coughing up some new ideas when your inspiration has otherwise cleared off down the pub. The creative options here are impressive and perhaps the only real downsides are that you are limited to the (albeit very good) loop content provided and you perhaps need a 61+ note keyboard to get the best out of it. However, if this loop manipulation front-end allowed you to import your own loops... well, that would certainly take things to another level. 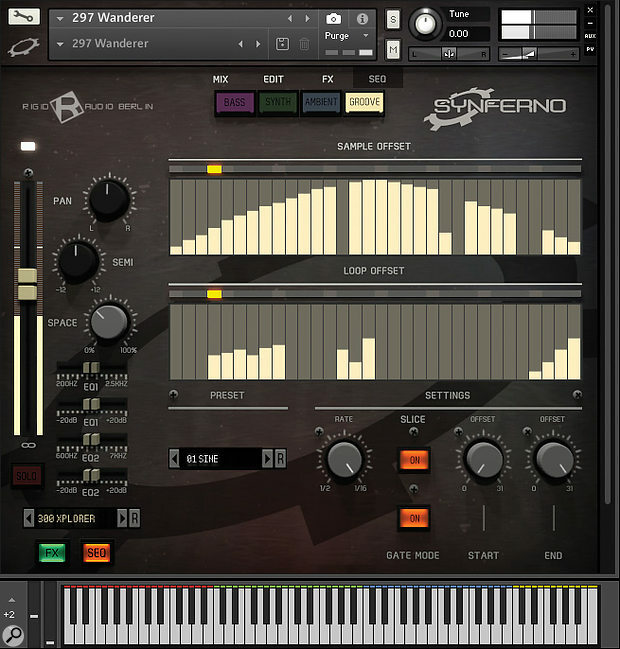 At £84$70, Synferno doesn’t fall into the casual purchase bracket, but it is most certainly an interesting tool for those looking for some fresh inspiration in their electronic music production. It’s also a front-end with considerable promise, so fingers crossed that Rigid Audio might consider taking it to the obvious next level at some stage and include a sample import feature.